As anyone who’s tried to keep a fickle houseplant alive knows, plant cultivation is not easy. While Matt Damon is growing potatoes on Mars, most of us are struggling to figure out why our bromeliads are drooping despite our unfettered attentions. Now imagine growing those plants in slightly less hospitable conditions- say, a few days of rain per year and months of 100+ºF temperatures. Sounds like a rough spot for even the hardiest cactus. One would be delusional at best to attempt to grow plants in such an environment, never mind base an entire country’s welfare on those plants’ success. If that’s true, then Dr. Gordon Sato may be the most delusional man on the planet. Like a surprising number of entries in oceanographic history, Gordon Sato’s scientific contributions can be traced back to World War II. Sato wasn’t in the Navy or working at Scripps, though: he was a teenager in a Japanese American internment camp. 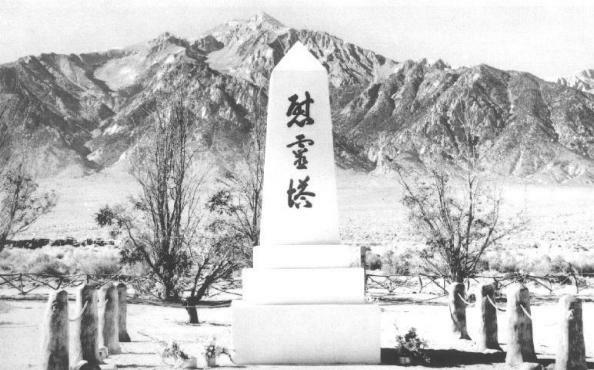 The Manzanar War Relocation Center held over 110,000 people in the parched Owens Desert of California. 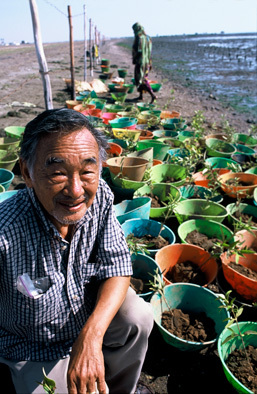 Although Sato hasn’t gone on the record with many comments about his time at Manzanar, he has described his improbable success at cultivating plants in the desert dust. That accomplishment hinted at a scientific aptitude that would lead him to earn his PhD at CalTech and launch a research career that included developing a novel cancer drug called Erbitux. When Sato retired from his illustrious career in the mid-1980s, he took up gardening, if growing a forest in the desert could be called that. After deciding to pursue a humanitarian effort in his retirement, Sato was introduced to Eritrea, a country in the horn of Africa. When Sato first visited, Eritrea was in the final years of a three-decade civil war with Ethiopia, a conflict that had ravaged its citizens. Compounding the horrors of war was a harsh climate with 2 cm of annual rainfall and temperatures that routinely topped 100ºF. It was not the place most people would pick for a reforestation project, but it was just what Sato was looking for. His memories of Manzanar motivated a desire to help the marginalized, and in Eritrea, he envisioned a way to green the desert and stabilize a local community in the process. The village of Hargigo was deeply impacted by the civil war. 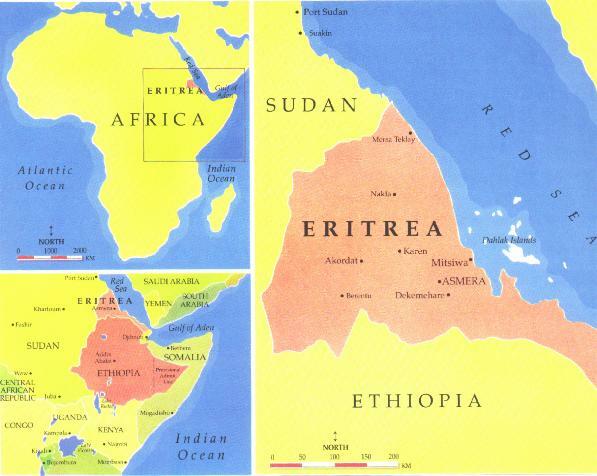 A center of Eritrean resistance in the 1970s, it was decimated by Ethiopian forces and only gradually resettled. The village included a barren coastline, an ephemeral watering hole, and a community of people with whom Gordon Sato felt a strong connection when he arrived in 1985. As Sato traveled around Eritrea, he began to make observations that probably came second-nature from his scientific training. He noticed mangrove trees growing near the Red Sea, and saw camels eating mangrove leaves. These mangroves stuck with Sato, possibly because the plants evoked memories of gardening in the Manzanar desert. A quick aside on mangroves might be useful here. Mangroves include about 80 species of salt-tolerant trees that grow along equatorial coastlines. They have prop roots growing above the water’s surface, which trap sediment, dissipate waves, and provide habitat for juvenile organisms. 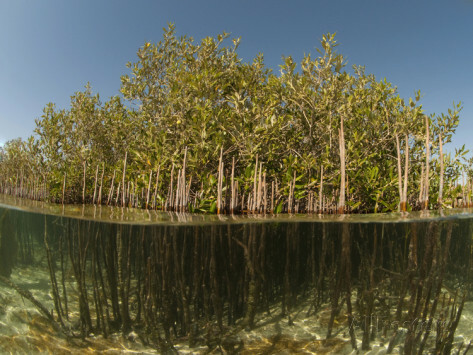 Mangrove habitats are also major carbon sinks, meaning they store carbon that would otherwise be released to the atmosphere, augmenting climate change. Despite their importance, mangrove forests are in free fall, with approximately 35% of habitat area lost between 1980 and 2000 alone. Restoring mangrove forests, therefore, is of paramount concern for environmental reasons- and, as it turns out, for humanitarian ones too. The mangroves that Sato saw growing along the Red Sea gave him an idea: why not plant mangroves along Hargigo’s coastline? Given the desert climate, it made sense to cultivate plants that could be irrigated by the ocean rather than rainfall. And if camels ate the mangrove leaves, maybe other livestock would too, creating the foundation for a sustainable village economy. Sato’s first mangrove planting was dismal failure, but for a scientist, this was probably par for the course. 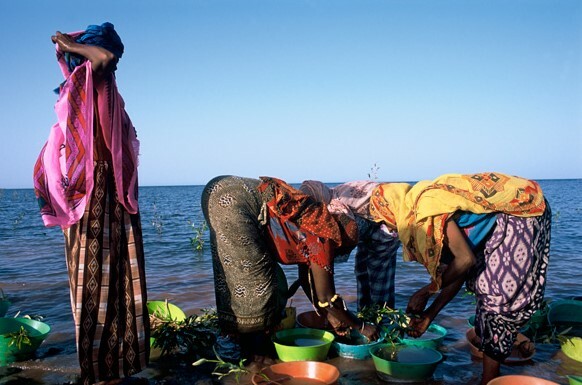 He began to reconsider those Red Sea mangroves, and realized that they grew in areas that received freshwater runoff during Eritrea’s infrequent rainstorms. The runoff delivered the nitrogen, phosphorus, and iron that mangroves required to survive. Sato began tinkering with a way to provide Hargigo’s mangroves with these nutrients, ultimately landing on the solution of burying a pouch of fertilizer and small piece of iron along with the mangroves. The fertilizer bag has three holes that allow the N and P to gradually leach out, providing a steady nutrient supply to the mangroves. Naturally irrigated by seawater and fertilized by the added nutrients, the Hargigo mangroves began to flourish. Today, the Hargigo coastline is lush with mangroves, but the beauty of the project extends far beyond mere aesthetics. Mangrove leaves are fed to sheep and goats that in turn provide meat and milk to villagers, the mangroves’ prop roots shelter fish communities, and the wood is harvested as firewood. 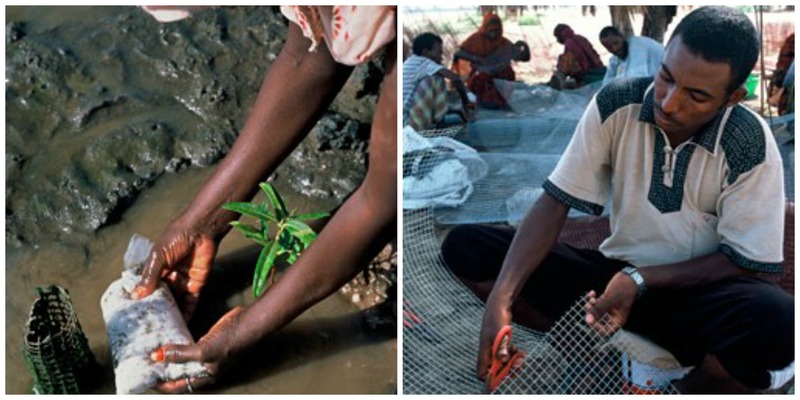 The citizens of Hargigo are full participants in the mangrove reforestation, from planting the saplings and fertilizer supplements to fostering the resulting livestock and fisheries. Gordon Sato named the effort the Manzanar Project, drawing a parallel between conditions in the eponymous internment camp and Eritrea. The Manzanar Project is still going strong, as Sato, nearly 88 years old, is expanding it in Mauritania. One could hardly imagine a more rewarding “retirement” for a scientist and humanitarian. Matt Damon may be the greatest botanist on Mars, but Dr. Gordon Sato is probably the greatest one on this planet. Tags: agriculture, botany, Eritrea, Gordon Sato, humanitarian, mangroves, Manzanar Project, restoration. Bookmark the permalink. Previous post ← 2-4-6-8, why should we collaborate? Quite an interesting article. We need to learn from Dr Sato by observing natural habitats and apply those habitats in similar (but perhaps distressed) ecological settings as opposed to our knee jerk reaction of applying some man made solution which usually is not enduring at all. Great read! The success of the Manzanar Project really highlights the beneficial relationship between mangroves and local economies, and the importance of conservation and restoration efforts elsewhere. Glad you enjoyed it, Lydia! I was doing some general research on mangroves when I came across the project, and it was really interesting to read up on it. Always inspirational to learn about efforts that address environmental & social welfare! So interesting to hear about this.